Hello everyone...sorry I've been away for so long. We've had family here this summer from 4 different states and crazy college stuff to get ready. I can't believe I missed a Tool Time last week. Yikes...I haven't even been on the computer in 2 weeks. To make up for all this lack of blogging, look for a give away coming soon!!!! Woo Hoo. Now on to TTT...if you are new to this blog, you're probably thinking what is a Tool Time Tuesday anyway? Well, I find items in hardware stores, offices supply, auto stores and even the grocery store and turn these items into useful gadgets for the sewing or the crafting room. These weird little things come in different sizes so make sure you try them on before you buy them. Hope you are having a great week so far and look for the give away in a few days!!! Sorry this is a quick one, but I should have left for work 10 minutes ago. Why can't I stay here and blog?!? 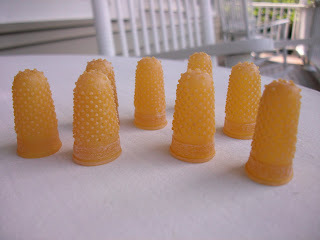 Another great and inexpensive idea! Too bad you can't stay home and blog, but work is definitely important! Thanks for the tip. I have used garden gloves before, and they work pretty well, but can be a little clumsy. School supplies are on sale everywhere right now. I missed you when you skipped last Tuesday, but...I also understand how it happens....and how hard it is to keep up with emails and blogs when we have houseguests! Karen....missed you while you were gone but hopefully you were having a wonderful time entertaining your family and friends and being a wonderful hostess! 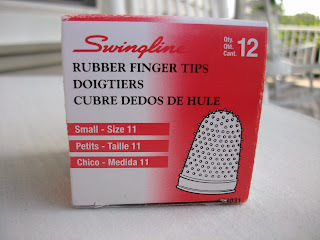 I love this little tip about the finger gripper thingees! I am going to try it and see! I will let you know! Have an awesome week! Thanks, Karen! 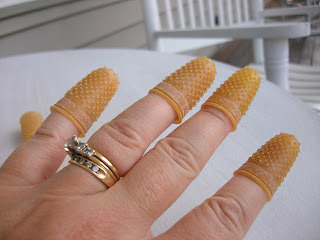 This tip may just help me "get a grip" on some of my quilting projects. Another cool idea, Karen. And yes, we missed you last week. Great idea! 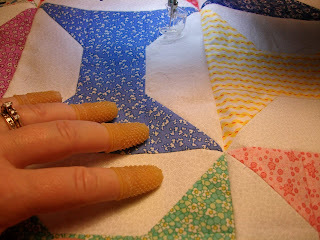 The quilting gloves always make my palms sweat! Thanks!! Thanks for another great tip!! Great idea! What a great idea, I'm going to give it a try. I've tried using gardening gloves with rubber fingertips but the gloves feel confining on my hands, I'm thinking I'll like this a lot better. I picked up some paint swatch books from HD (Home Deopt) yesterday so I could try different color combinations as shown last week. Thanks for another helpful 'tip'! You are so creative. The gloves are very warm when it's 90 degrees. Thanks again...piece. I'm a first time visitor and I'm having an absolute blast perusing your blog. My mind is racing with all the wonderful ideas you've shared. Right now, I'm eyeing the coffee filters I bought that are too small for our Bunn and know they'll be put to good use in my quilting endeavors! Thank you. I will be stopping by regularly. Thank you for the great tip! My friend, Joyce, from Plain Ol Vanilla sent me to visit. What fun I'm going to have exploring. Love your tips and your blog; thank you so much for sharing them! How do I sign up to follow sew many ways?